For versatility, the ValveKing rules, with a tone that can easily cover almost any musical base, thanks to its clever Vari-Class control. Very authentic vintage USA sounds, tailor-made for blues, rockabilly, redneck jazz and more. A little more clean headroom would make the overdrive channel much more effective. It seems that we guitar players can't get enough of small guitar amps. 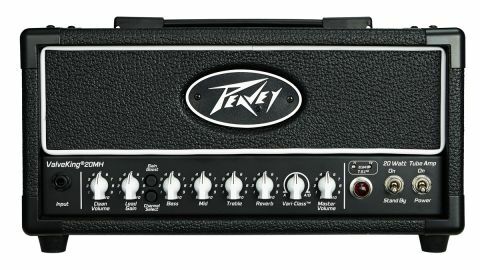 To underline that, Peavey has just released new versions of three of its most popular heads, in a new series called Mini Heads. Today we have the range's ValveKing 20 MH up for review. Now part of the Mini Head range, the ValveKing 20 combines some serious boutique features at a very affordable price point. Inside its particle-board cabinet, the electronics are printed circuit-board based, and laid out neatly in typical Peavey fashion. The front panel has a single input jack with controls for clean and lead gain, bass mid and treble, reverb level and master volume. There are buttons for channel select and gain boost, both of which can also be foot-switched. Between these last two is the ValveKing's clever 'Vari-Class' control, which continuously varies the dual-EL84 output stage operation from two-valve Class AB push-pull to single-ended pure Class A. Around the back, there's a speaker outlet with switchable impedance and a three-stage attenuator that varies the full 20-watt power rating down to five watts and one watt. Next to this is Peavey's MSDI output, which provides a balanced out with switchable speaker emulation, speaker defeat and ground lift, as well as a regular 3.5mm headphone socket. There's also a series effects loop, a USB recording output, and provision for a pair of two-button footswitches, to control channel, boost, reverb and effects loop selection. The ValveKing 20 MH has one feature in particular that sets it apart: Vari-Class. A simple knob on the control panel takes the ValveKing's trick output stage from Class AB push-pull at one extreme to single-ended pure Class A at the other, with every variation in between, going from dynamic punch with a fast attack to smooth compression and a thicker midrange. It's a very versatile amp that sounds great for rock, metal or jazz. There's plenty of gain on tap to suit practically any guitar - you won't quite turn a regular-output Strat into a fire-breathing distortion monster, but you can get quite close. At the other extreme, the ValveKing is capable of some surprisingly lush, fat clean tones that work very nicely for jazzier styles, especially with a dab of the onboard digital reverb. Teamed with a PAF-loaded Les Paul and running near pure Class A, the ValveKing 20 does a good job of translating the guitar's acoustic warmth and sustain into an excellent vintage jazz tone - the Les Paul guitar is practically synonymous with rock today, but it's worth remembering that Les himself had deep roots in jazz. All three amps in the Mini Head impress with their similar back panel features: the MSDI output sounds quite realistic and delivers a good clean signal to live or studio desks, while the USB connector works faultlessly on our Win7 PC DAW. A good word is due for the built-in reverb, too, which sounds a lot more expensive than it is and easily frees up an outboard digital effect. Peavey's manufacturing and design expertise has been fully leveraged with these heads; they look great and sound very impressive, with power and clean headroom to handle most smaller gigs, and studio-friendly features that make a huge difference when it comes to getting tracks down fast. The price is reasonably competitive, bearing in mind these are all real valve amps and all three heads look and sound anything but bargain basement.